Nigel Amschwand will show some of Erich Mayer’s works of the Northern Cape that he obtained from the National Cultural History Museum, as well as some present-day photographs taken from similar viewpoints. While Nigel was doing research for a VASSA report on the farm Grasberg / Avontuur, he discovered that Mayer had stayed on the farm for a while as a school teacher. This prompted Nigel to track his story, which he’ll share with us. 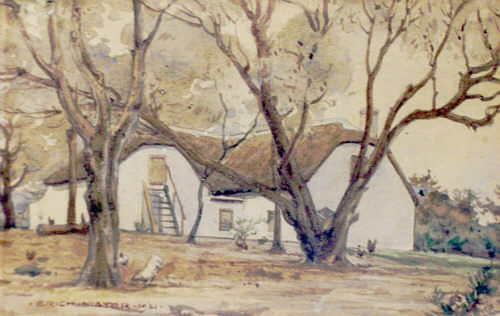 Mayer is well known for his depictions of vernacular architecture and life in the South African countryside. He spent two periods in the Onder-Bokkeveld, an area that VASSA researchers have spent a lot of time in. Born in Karlsruhe, Germany in 1876 Mayer moved to South Africa in 1898, seeking a better climate for his health. He took up employment as Assistant Land-Surveyor in the Orange Free State, and a year later joined the Boer side in the Anglo-Boer War. During his time on commando he would often sketch portraits of farmers he encountered. In 1900 Mayer was captured by the British forces and interned at St. Helena. In 1904 he moved to South West Africa, and continued travelling to Germany between 1904 and 1911 to take drawing and painting courses in both Karlsruhe and Stuttgart. He returned to South Africa in 1911, settling in Potchefstroom where he befriended Pierneef and Wenning whom he regarded as close friends. By 1914 he had his first successful exhibition; however, after the First World War broke out he was interned for 21 months in Pietermaritzburg, which took a heavy toll on his health and affected his work for several years to come. In 1920, Mayer had an important exhibition in Stellenbosch, before deciding to move to Johannesburg in 1921. Following his marriage in 1928 he and his wife Margaretha Gutter travelled around South Africa recording scenes of everyday life that allowed him “to study the country, its people, and its features closely” (Van der Westhuysen). The couple moved to Pretoria in 1931, starting a weaving and spinning school in 1933. Whereas previously he had worked mainly in watercolour, Mayer started working in oils and also on a larger scale, completing a few large murals in the Johannesburg Main Post Office and the Monument High School in Krugersdorp. He decided to further his studies and moved to Florence, Italy for a year in 1935, studying under Chini and Annigonni. On his return he exhibited around the country and was awarded a Medal of Honour for Painting by the ‘Suid-Afrikaanse Akademie’ in 1943. He died in Pretoria in 1960 and in 1962 his work was included in an exhibition titled ‘Art in South West Africa’ at the South African National Gallery in Cape Town and in 1972 at the Prestige Retrospective Exhibition at the Pretoria Art Museum. The annual Weekend Away (26- 28 April) to Ladysmith & Calitzdorp districts, organised by Pat Kramer, is limited to 20 members and is fully booked.